I am writing this with one blocked nostril and some fever after a sleepless night, and having missed to go for my 25km easy run this morning. The previous day as I did my morning run in a group of four athletes on a rough road around Eldoret, a SUV that was raising a lot of dust quickly approached us. One of the athletes in the group waved at it to slow down in order to reduce the intensity of the cloud of dust that was about to engulf us, but to no avail. The SUV zoomed past leaving us gasping for breath inside the red cloud that lasted for a few more minutes on the road ahead of us. Interestingly, the registration number on the vehicle indicated that it belonged to an entity that the public were crying foul that they did spend a lot of money hosting parties to watch the Berlin Marathon. 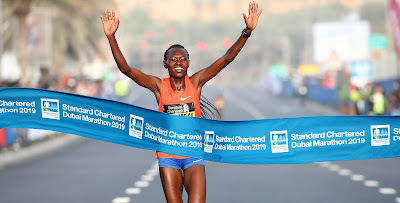 It is amazing that they could spend millions of Kenyan shillings to watch athletes run abroad, but cannot slow down to avoid hitting them while on their training runs here in Kenya! That vehicle is most likely to be the cause of my illness that has resulted in my having to miss my training today. Checking the social media after waking up, I just saw another athlete complaining of having been knocked down by a motorcycle and I found my case to be even much less serious than what many other athletes go through. But, that aside, I know there are many more motorists out there who care about athletes but may not understand how to help make their training less impossible. Below are some of the things that athletes would be so grateful if you would do for them on the roads. Slow down on dusty roads when you approach them, they are already hurting and panting while running in fresh air and there is absolutely no more reason to fill their lungs with soil. When you drive behind the athletes, slow down and automatically they will move to one side of the road. Use the shortest time to pass. Some motorists stay behind the athletes too long which leaves them running on rugged surfaces beside the road as they wait for the vehicle to pass. This often results in injuries that can cost some athletes their dream races. It is also quite uncomfortable to have a vehicle following you when you are so tired and afraid you could collapse any moment and get ran over. Not only would runners appealing to the motorists, there are the people who stand in the middle of the road when athletes are running towards them so that they suddenly pretend to give way when they are already to close and end up being knocked down by the athlete, or vice versa. To the herders, we would appreciate it so much if you moved the cattle to one side of the road when a group of athletes come running towards you.